The other day, I went looking for some images / video of brown coal mining in Germany. Turns out Germany mines about 170,000,000 tons of the stuff every year to supply around 25% of her electric power. Ironically it seems to hang on because it is the only energy source for generating electricity cheaper than solar / wind. I mean, what else do you do with brown coal but burn it? It's not like you could turn it into the coke necessary to make high-grade steel. Anyway, I found some video taken at 4K by a drone. Germans are often efficient because they love to build BIG things. This also explains why Germany, which has led the charge on renewables, still has one of highest per capita carbon footprints. Brown coal is dirty stuff but if you can scoop up thousands of tons per day with a few skilled operators, it makes "economic" sense to scoop. The following article is from Australia. That country is providing China with a LOT of coal. So there is a whiff of "see, we are no worse than the Germans." But only a whiff. And I'll bet there are many Germans who hate the burning of brown coal as much as her neighbors. Germany's reputation as a pioneer of clean, green energy seems a far cry from the reality on the ground in the village of Atterwasch. It's been called one of the greatest social experiments in German history, comparable with the process of reunification after the fall of the Berlin Wall. That social experiment � known as Energiewende, or "energy transition" � is a living reality in the centuries-old village of Atterwasch, in the eastern German region of Lusatia, close to the Polish border. Next to the village church, which dates back to 1294, the rectory roof sports an impressive rack of solar panels. The solar array recently won an "Ecumenical Environmental Award" from the Ecumenical Council of Berlin-Brandenburg. Wind turbines turn over the low hills that rise above the village, and the surrounding countryside is dotted with small-scale wind farms and solar parks amidst fields of maize, apple orchards, and vineyards. The "energy transition" is an ambitious set of policy measures introduced by Angela Merkel's government in 2011. In the short term, Germany aims to generate 35 per cent of its electricity from renewables by 2020. By 2050, that figure will reach 80 per cent, and according to Felix Christian Matthes, of the Institute of Applied Ecology in Berlin, Europe's largest economy will be approaching full decarbonisation. Germany seems well on track to reaching that target. Already, 30 per cent of its electricity comes from renewables. But the energy transition has a dirty secret. Renewables have been so successful that the only energy source that is still cheaper is brown coal. Since 2007, Atterwasch and four other villages have been facing demolition to make way for new open-cut brown coal mining operations in Lusatia. In May this year, 3,500 protesters occupied the Welzow-S�d open-cut brown coal mine in Lusatia, stopping diggers, conveyor belts and train tracks and forcing the owner of the mine, the Swedish state-owned company Vattenfall, to halt operations there for a weekend. The protest, known as Ende Gel�nde, was one of a number of simultaneous actions around the world � including a blockade of the Newcastle coal terminal on Australia's east coast � with one simple aim: to keep coal in the ground. Coal is responsible for 46 per cent of global CO2 emissions. Research published last year in the journal Nature by Christophe McGlade and Paul Ekins of University College London showed that more than 80 per cent of the world's remaining coal reserves have to stay in the ground if we're to keep average global temperature rise below two degrees � the figure agreed on at the Paris Climate Summit. At the protests in Lusatia, 52 organisations, including Friends of the Earth, 350.org and Oxfam joined forces with local people from the nearby villages of Proschim and Spremberg, who have been fighting since 2007 to prevent their homes being bulldozed. A group of around 300 protestors pulled down fences around the Schwarze Pumpe coal-fired power plant adjacent to the mine and attempted to occupy the plant. Police arrested 120 people and charged them with breach of the peace. Also taking part were people from the villages of Atterwasch, Kerkwitz and Grabko, around 100 km away. 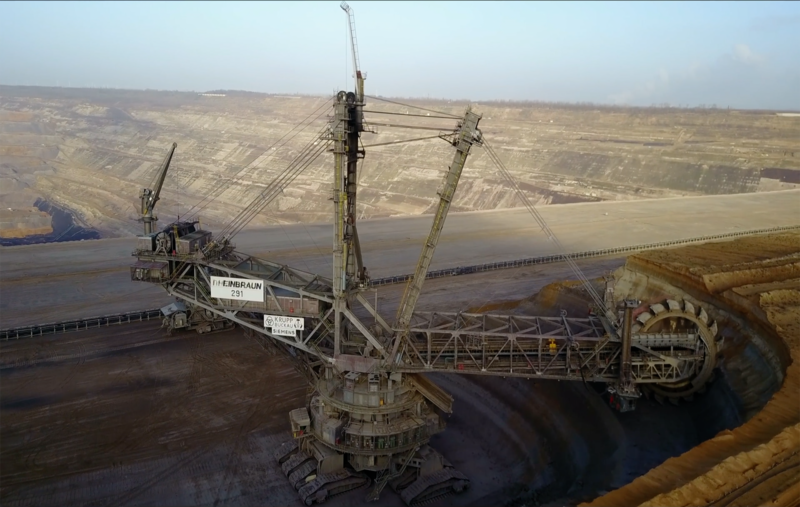 The villages are facing demolition to allow for an extension of the J�nschwalde North open-cut brown coal mine � also owned, until recently, by Vattenfall. "For me personally, that's not the way I'd choose to protest," says Monika Schulz-H�pfner, former mayor of the village of Atterwasch, and member of the Brandenburg state parliament for 20 years, "but in these tense times, and considering the situation we're all in, civil disobedience of this kind is absolutely acceptable." Ms Schulz-H�pfner, who was dropped from preselection by her own Christian Democrat party because of her strong opposition to coal mining, refused to distance herself from the protests. "It's a great feeling to be here," she says. "We feel we're connected to people all over the world who are coming together to do something about climate change and support the goals of the Paris summit." One of Ms Schulz-H�pfner's neighbours in Atterwasch is Ulrich Schulz, whose family have been farming land there since the time of the Thirty Years War. Mr Schulz carries on this long tradition, growing crops � mostly for feed � and breeding cattle, pigs, and chickens. Alongside his barn is a biogas plant, which generates 160 kilowatts of electricity and heats the poutry pens in winter. All that could come to an end if the mine extension goes ahead. "This sword of Damocles has been hanging over us for years," Mr Schulz told me when I first visited him in September 2014. "The whole farm is sitting on top of a coal seam. Where we're standing would be a gaping hole. What it would mean for us financially, I don't even want to think about. What it would mean for our morale? Well, it'd be just be a disaster." Of course, not everyone thinks the coal mines are a bad thing. "Coal means a lot to me," says Marco Bedrich, a 22-year-old electronics technician at the J�nschwalde power plant, Germany's largest brown-coal-fired power plant. "It means being able to stay here in my home. It means I can build a house here with the money that I've earned. Without brown coal we'd lose most of the jobs in this region." Like much of eastern Germany after reunification, Lusatia experienced rapid de-industrialisation. The textile and glass industries were decimated, and 80 per cent of the coal mines and power plants closed down. "The number of jobs in the coal industry in eastern Germany has shrunk from 100,000 to 17,000," says Wolfgang Rupieper, a former judge and spokesman for Pro Lausitzer Braunkohle, an organisation set up to promote the future of the coal industry. "Brown coal production has already been dramatically reduced. We don't want skilled workers leaving the region, and we don't want to lose all of our young people. "Every year Vattenfall takes on 250 to 300 apprentices in the coal industry. They learn a range of trades, and they earn good money when they're finished. Sure, they could leave and find jobs elsewhere in Germany, but then our region would be depopulated." Earlier this year, Vattenfall sold all of its coal mines and power plants in Lusatia to the Czech company EPH. It's not clear yet what this means for the threatened villages. But both Mr Schulz and Ms Schulz-H�pfner believe coal mining is out of step with Germany's "energy transition" . While the number of jobs in coal mining across the whole country has shrunk to 50,000, the renewable energy sector employs more than 400,000 people. Ms Schulz-H�pfner wants the state governments of Brandenburg and Saxony to get opponents and supporters of the coal industry together around one table to plan a structural transformation which will boost investment in renewables and move the region towards a future beyond coal. "We're living the energy transition already," says Ms Schulz-H�pfner. "We have solar cells on our roof, wind turbines in the fields, we drive an electric car. We don't just talk about it, we live it.